This pasta recipe is a great way to use fresh pumpkin. 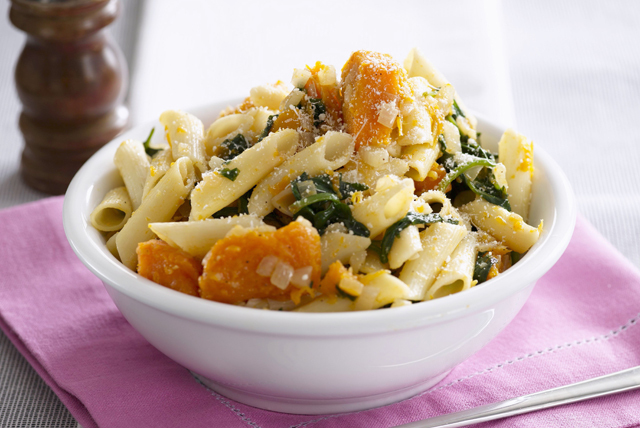 Easy to toss together and packed with flavour, this pumpkin and spinach pasta is sure to be a hit when served as part of your next dinner. Flavoured with basil dressing and finished with aged Parmesan, this dish is a keeper! Meanwhile, place pumpkin in microwaveable bowl. Add water; cover with paper towel. Microwave on HIGH 8 min. or until pumpkin is tender; drain. Drain pasta, reserving 1/4 cup cooking water. Heat dressing in large skillet on medium heat. Add onions, garlic and pumpkin; stir. Cook 5 min., stirring occasionally. Add spinach, pasta and reserved cooking water; mix well. Cook and stir 1 min. Garnish with fresh basil or parsley before serving. Add 1/4 cup crumbled cooked bacon to cooked pumpkin mixture in skillet along with the spinach, cooked pasta and reserved pasta cooking water.